Young and old skiing fans are in good hands in the Gitschberg Jochtal ski resort. Everyday on your skiing holiday in Valles it’s time to: fasten your skis and hit the slopes! After all, the Gitschberg Jochtal ski resort is right on our doorstep. With 55 km of slopes and 15 lifts, it’s also perfect for more leisurely skiing. It is particularly suitable for families and recreational skiers who appreciate the calm away from the busier slopes. If you or your children want to quickly turn into proficient skiers, the ski instructors of the Vals Jochtal ski school are the right people to go to. The ski school offers children’s courses, adult courses, private and group lessons as well as snowboard and cross-country skiing courses. There is also full day care for children. In the Kinderland right next to the Jochtal valley station in the centre of Valles, there are magic carpets, the Bambino express, a Bambino tent, a tubing lane, bunging tunnel and other teaching aids. The partners of our Alpine Hotel Masl also includes three ski rental companies with top ski equipment. In the village itself, you can hire your entire ski equipment at a special discounted price. In addition to all this outdoor exercise in the snow, we also have something for your taste buds. There are numerous cosy Alpine huts for you to stop at along the way. Here, you can enjoy typical South Tyrolean specialities and your little ones are sure to find their favourite food on the menu. The Skirama-Valle Isarco ski pass gives you access both to the Gitschberg Jochtal and Plose ski resorts. 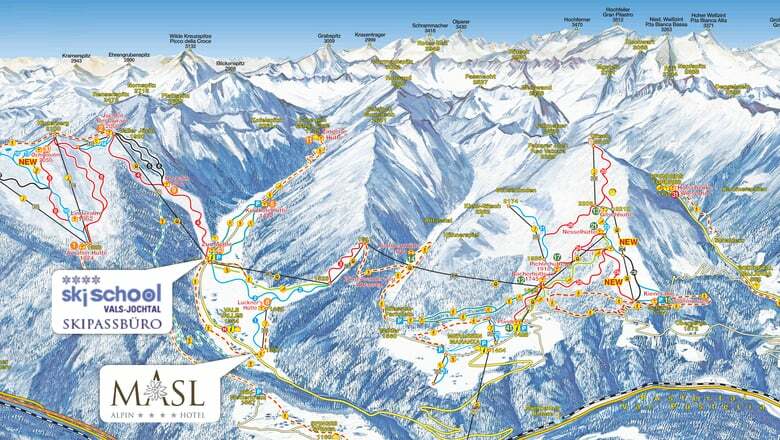 Plus, the entire area is part of Dolomiti SuperSki, the world’s largest ski carousel with 1,200 km of slopes. Plan de Corones, Sellaronda, Val Gardena, Marmolada are just some of the skiing destinations that you can reach from the Alpin Hotel Masl. And if you sometimes don’t want to put on your skis, there are lots of other ways to enjoy winter in Valles and the surrounding area. How about a winter or snowshoe hike, a jolly toboggan ride around on the magnificent cross-country skiing tracks? Just find something that is right for you!